Learn everything you need to become a curber. Come to our expert one-day trainings in Wisconsin or let us come to you. With our years of experience of curbing and running a business, we can train you and your entire team to become the best curbers possible. 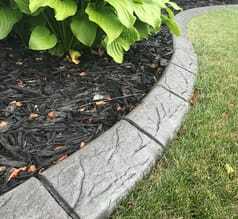 For companies getting started in the curbing industry. For curbers looking to earn more per job. 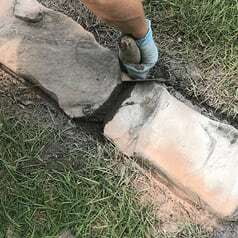 Select this option to get the benefits of both CURBING 101 and NATURAL STONE TRAINING with a savings of $1,000. In the classroom portion of the training, you’ll learn everything that you need to know about the curbing industry and the business side of your new company. This includes a wide range of topics ranging from marketing and advertising to systems that ensure you have everything you need when you show up to a job. It’s a lot of information, but don’t worry – you’ll be leaving with a detailed training manual outlining everything we discussed. 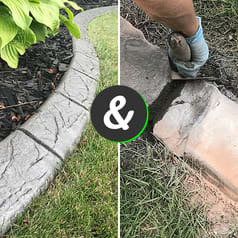 The hands-on training gets you into the actual curbing process, showing you the best techniques and methods to create the best-looking curb as quickly, easily, and profitably as possible. Our training experts will run through everything with you, fielding any questions you may have along the way. Get ready for a full breakdown of a full job including mixing, extruding, troweling/finishing, stamping, and everything else your clients expect. Learn how the business runs before you start your own. Starting a business on your own is an intimidating thing to do, but it doesn’t need to be. Instead of jumping straight into it with little to no knowledge, come to our training to learn what a normal day looks like a curber. You’ll be able to see how the job is done and make a better decision on whether the curbing business is right for you. Can’t travel to Wisconsin for our trainings? While most of our training takes place in Wisconsin, we are completely capable of bringing the training to you and your team. We’ll bring all of the necessary equipment and knowledge to share with you for a full day of training just like you would receive in our home town. Simply speak to one of our training experts to discuss pricing for us to travel to you and your team. Get the natural stone stamp set & other essential tools completely free with the purchase of our Natural Stone Training. Contact us to speak with a training expert who can answer your questions and register you for training.